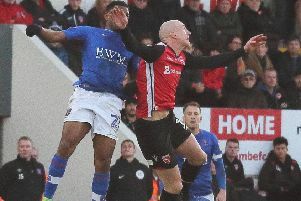 Morecambe boss Jim Bentley has warned his side their season is in danger of fizzling out. The Shrimps slipped to one of their worst displays of the season as they went down 2-0 at home to Cambridge on Saturday. It meant that for the second home game in a row Bentley saw his side miss a golden opportunity to gain ground on the League 2 play-off places. The Shrimps are now nine points off the top seven ahead of trips to Oxford tonight, Tuesday, and Luton on Saturday. Bentley said: “If we’re going to be as inconsistent as we are at the moment then it’s going to be very difficult for us to get closer to the play-offs. “That’s the frustrating thing because I don’t want the season to fizzle out. “The league’s that tight as well. It only takes one or two teams to win below you and you can get dragged in. “I’m not saying that’s the case for one minute but that’s how strange football is and how strange the league is. “It’s a good job we’ve got a game on Tuesday but I don’t want to keep asking for a response. “I want players to go and back one victory up with another one. But it’s why we are where we are, we’re too inconsistent, we’re too up and down. Oxford are just five points clear of the drop zone ahead of the meeting on Tuesday night but Bentley admits to being impressed by Michael Appleton’s side when they lost 1-0 at the Globe Arena earlier in the season. The Shrimps boss said: “They were excellent. “We got the victory on the night but they really popped it round and were a good footballing side. “They’re a big club with good players but for one reason or another the results haven’t followed. Bentley has almost a fully fit squad to choose from at the moment and could shuffle his pack over the next week, especially given the manner of the defeat to Cambridge. He said: “Coming to this stage of the season there’s a lot of players who’ve played a lot of minutes. “We got one or two knocks at the weekend but we’re relatively injury free at the moment apart from big Barry Roche.